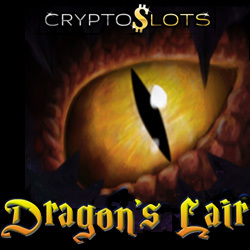 CryptoSlots.com is bringing you the exciting new Dragon's Lair. This new slot transports you into the mystical world of dragons, goblins and magical crystals. CryptoSlots.com is a new online casino that uses only cryptocurrency for deposits and withdrawals. Until July 30, CryptoSlots is giving you up to 40% match on your deposits, three times daily for six days. Dragon's Lair has a Double Wild symbol to boost wins. And when three or more Click Me symbols appear on the reels, you click one to reveal a bet multiplier up to 100X. Available in the instant-play online casino and in the mobile casino for smartphones and tablets, Dragon's Lair has a wide betting range of $0.15 - $375 to suit all kinds of players. Cryptocurrencies are quickly becoming a favorite of online casino players since transactions are fast, easy and secure and transaction fees are low. CryptoSlots automatically converts cryptocurrency deposits to US dollars for play. Sign-up is simple, requiring only an email address. All games are provably fair and can be played on any computer, smartphone or tablet. Bitcoin, Litecoin and especially Bitcoin Cash withdrawals can be processed very quickly. Available July 25-30th, 2018 only. Valid on Dragon's Lair only. May be claimed up to 3x per day. Wagering requirement 35X. At CryptoSlots, deposits and withdrawals are made with Bitcoins, Bitcoin Cash or Litecoins only, has a million-dollar jackpot game and 22 unique slots and video poker games. Originally developed for the casino’s parent sites, Slotland.eu and WinADayCasino.eu, five of these games are high limit variations, unique to CryptoSlots. Played with tokens collected while playing other CryptoSlots, the one of a kind Jackpot Trigger game gives you a chance to win up to $1,000,000 in a single spin.